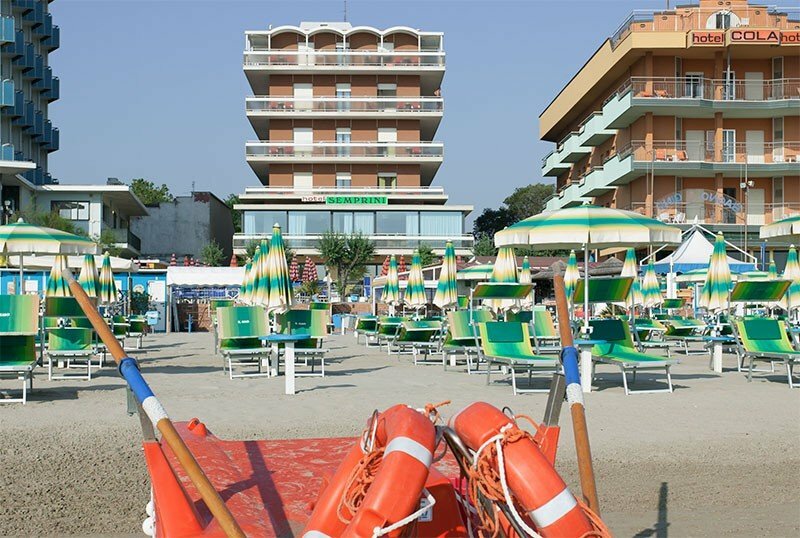 The Hotel Semprini is a 3 star family run hotel in Bellaria, directly on the sea, with numerous services dedicated to families, private bathing establishment. Accepts small and medium-sized pets. The hotel is facing the sea, with direct access to the beach. It is a 15-minute walk from Bellaria Train Station and around a 10-minute drive from the Parco Acquatico Atlantica. The rooms, functional and bright, are all equipped with balcony (some with sea view), telephone, safe, WI-FI, satellite TV and digital terrestrial, air conditioning and private bathroom with hairdryer and shower. Minibar on request. The hotel has a private beach a few steps from the hotel, a open-air porch, a garden and bikes for free use. The structure is equipped for cyclists and inside it has a lobby, relaxation area, reading room with newspapers in use, bar and restaurant. The staff organizes theme nights. PARKING: outdoor parking for all guests and garage (10 seats) free. CONVENTIONS: beach, gym and amusement parks. Paid organized excursions. SERVICES FOR DISABLED: entrance on the ground floor with inclined ramp, elevator in accordance with. PETS: small and medium-sized animals allowed. BREAKFAST: international buffet, with sweet and savory dishes. LUNCH AND DINNER: 3 choice menu of meat, fish and vegetarian, with pasta always homemade. In hotel: strollers, indoor playground area equipped with table tennis, table football, video games and TV. Pediatrician and babysitter on request and for a fee. In the room: free cot, bottle warmer. The hotel has a private beach with a playground area for children, sports fields and entertainment. Prices are per day, per person in a double room. TOURIST TAX: not required by the Municipality. - In case of delayed arrival or early departure, charges will be charged to the Sigg. customers 70% of the pension price.